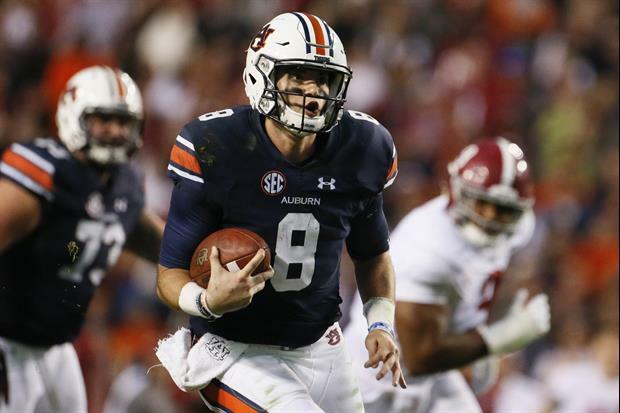 Auburn quarterback Jarrett Stidham announced Tuesday night that he will forgo his final year of eligibility and enter the 2019 NFL Draft. Shortly after the announcement, head coach Gus Malzhan released a statement congratulating Stidham on a terrific college career and revealed they he will play in the Music City Bowl against Purdue. The junior signal caller plans to make it 27 starts at Auburn as he intends to play in the Franklin American Mortgage Music City Bowl against Purdue on Dec. 28. "Jarrett has been a terrific player for us the last two years, leading us to an SEC West title and becoming one of the most prolific passers in Auburn history," Auburn head coach Gus Malzahn said. "He has tremendous ability and a bright future ahead of him. I look forward to seeing Jarrett perform one more time in an Auburn uniform and can't wait to see him playing in the NFL next year and for years to come." AU would have been just as good with Jason Statham at QB. Not a great decision. Wonder why he did not transfer to develop 1 more year? Rats jumping off a sinking ship. I wouldn't call Stidham a rat. $cam, Fairley, Bobby Lowder, Milt McGregor, etc, are rats, but not Stidham. In an equally monumental announcement, I myself have decided to NOT enter the 2019 NFL Draft.